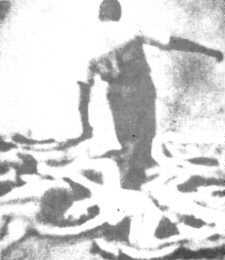 “Corpses of gassed prisoners at the exit of the gas chambers, before they are burnt.” An enlarged section of a “photograph” claimed to have been secretly taken of the output of a gas chamber. The picture features a group of men on the right, a man with impossibly long arms and two elbows, plumes of smoke and a foreground strewn with “bodies.” It appears in several books, including The Yellow Star and the large-format edition of Shirer’s Rise and Fall of the Third Reich . This is the most detailed “body” in the picture. Often the “photograph” is reproduced at small size, for obvious reasons. Many of the Holocaust and other WWII atrocity photographs shown in Forged War Crimes can be viewed in our public libraries, where they are presented as authentic. By comparing versions in different books and analyzing lighting and scale, this astonishing book exposes them as forgeries. They are the product of Stalin’s Cold War propaganda operation and many are merely photographed drawings. For exposing fraud its author, Udo Walendy, was imprisoned in Germany. The judge told him “We are sentencing you not for what you wrote, but for what you left out.” Forged War Crimes Malign the German Nation by Udo Walendy, 80 pages, 58 b/w photographs, ISBN 1-901240-00-2, 1996. KZ-guard, victims in Buchenwald: “In the SS-government, the perfect slave system.” Published with this text in Der Spiegel 10.10.1966 No. 42, p. 101. This picture is fabricated. The lighting of the left side of the picture is definitely different from the right side. The facial contours of the prisoners are unrecognizable, whereas the contours of the “SS-Unterscharführer” are visible to the last detail. Whereas the prone prisoner throws a clear shadow, the “SS-Unterscharführer” casts no shadow. The upper part of the uniform of the “guard” (above the belt) does not match the lower part. The side pockets under the belt are missing; the buttoned edge of the jacket does not run correctly from top to bottom; the left hand (right in the picture) should be in the shade, whereas it is brightly lit. 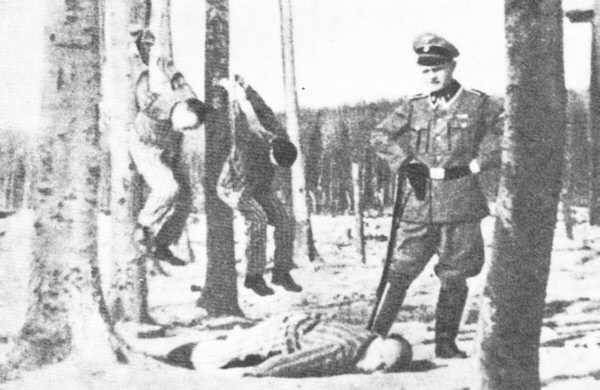 An SS-Unterscharführer was not allowed to wear officers’ trousers with boots at all; the pistol hangs on the wrong side. It is unlikely, that prisoners would be hanged from such trees, which at best would only have a hold very high in the crown, and that they would be hanged in this manner. Hanged people with pulled up legs are non-existent. In Jan. 1968, in the museum of the Dachau-Memorial, the editor could see clearly on a life-size enlargement that they forgot to draw in the ropes in this picture by which the two “hanged prisoners” were supposed to hang. As such, they are floating in the air without ropes. 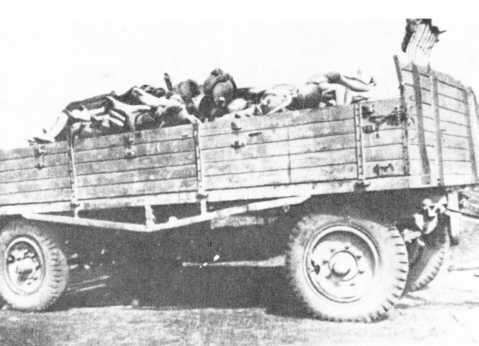 “Trailers with corpses of prisoners, CC-Buchenwald.” Published with this text in R. Schnabel, Macht ohne Moral p. 343. This picture is also fabricated. This is clearly recognizable by comparing enlargements of this print and the reproduction in SS im Einsatz Berlin East 1957, p. 193, and Buchenwald – Mahnung und Verpflichtung – Dokumente und Berichte , Berlin-East, no-date, picture supplement. The wheels differ. The legs in the back part do not fit anatomically and perspectively to the front body parts. The unclarity of the load contradicts the clearness of the trailer parts. The anatomy of the “bodies” is much too small in comparison to the trailer. 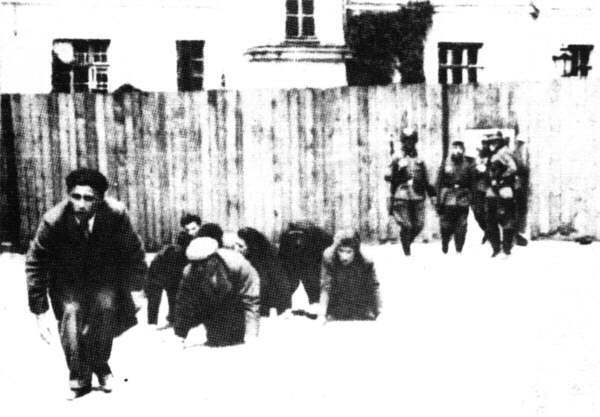 “Poles are forced to crawl on the ground in the Lemberg ghetto.” Published with this text in Macht ohne Moral by R. Schnabel, p. 442. This picture is also a fabrication. A typical sign is the contourless white foreground which reaches to behind the gate with no differences in lighting. According to the house, the light comes from the left, whereas the “Poles” are lit from the back and only throw short shadows between the bodies which points to the sun shining vertically onto them (impossible in Poland). 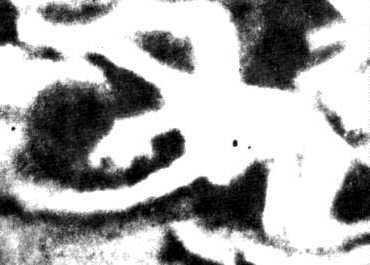 The enlargement of the photo reveals that the building never existed, as all building lines run crooked to each other. The perspective investigation reveals that the soldiers, fence, lantern, and house are much too big in comparison to the front “Pole” at a distance of at least 10m and for a frontal photograph; they are standing much too “high.” The head of the crawling “Pole,” who is apparently talking to the woman, does not fit anatomically to his body at all and is, apart from that, much too dark in comparison with his hands. “The terror in the occupied areas had a first aim: the extermination of the Jewish population and the intimidation of all residents who did not subject themselves completely to the regime. The Gestapo brought women and children to be shot.” Published with this text in K. Zentner IIIustrierte Geschichte des Zweiten Weltkrieges p. 490. A better, touched-up version was published in Der gelbe Stern Lc.p. 96, ( The Yellow Star ). A comparison between the pictures on p. 26 and 27 reveals the forgery even more clearly than would be recognized from one picture. All women are wearing something different. In one picture, underclothes with a V-cut, in the other one with a round cut. The woman on the left wears pants in the one picture and a skirt, which she has pulled up, in the other. The different drawing of the clothing and the soldiers on the left and right of the picture speaks an equally eloquent language of wrong perspective (the sizes of the soldiers are too varied) and once again the ground is tilted too much. The whole situation is completely unrealistic. Before an execution, one does not look so relaxed in a group photo, and on top of that – how embarrassing for the forgers – barefoot in Lettland on the 15th December, 1941, with over minus 40 deg. C frost! 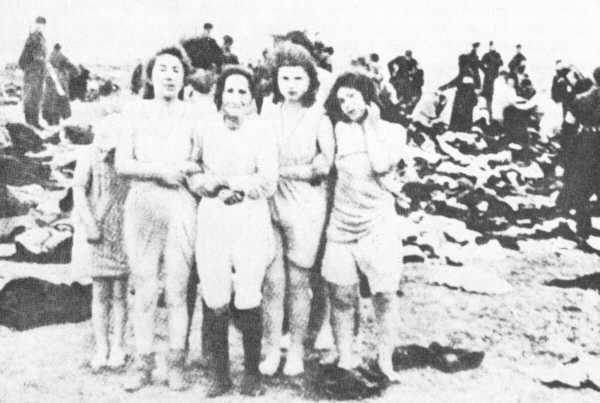 The completely shadow-less underpants of the elder woman, in comparison with the vests and pants of the other women and the typically black and white contrast of the clothing on the right and the completely different lay-out on the left, prove that this is a drawing and not a photo. 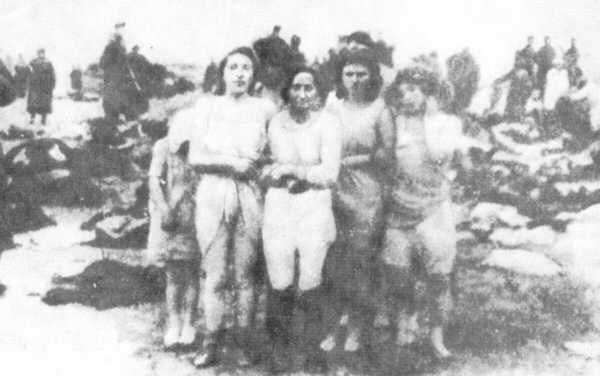 “A group of women before being shot. On the left of the picture is Purve Rosa, worker in the factory ‘Kursa’ and her mother next to her. Photograph from the chief of the Gestapo unit in Ljiepaja, Hauptscharfuehrer Karl Schrot, 15th December 1941.” Published with this text in Verbrecherische Ziele – verbrecherische Mittel by the “Institut fuer Marxismus – Leninismus beim ZK der KPdSU,” Moskau 1963, p. 132. 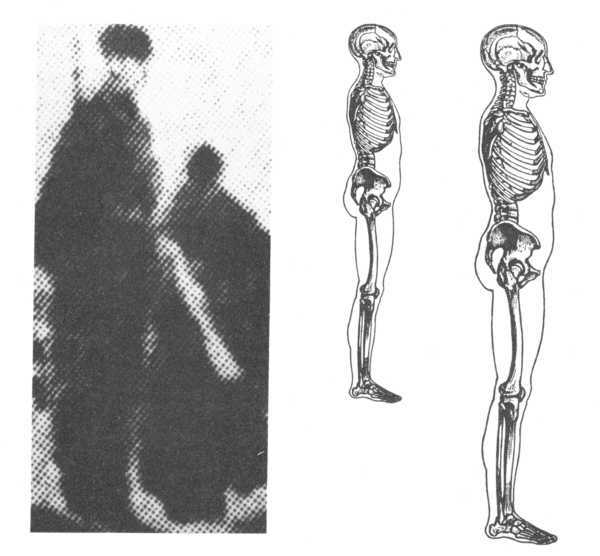 Enlarged section of picture on p. 26 (“soldier” on the left) in comparison to a genuine human bone structure. 1. Based on a comparison of the size of the head. 2. Based on a comparison of the length of the body.